GET DOUBLE THE PROTECTION FOR YOUR LEGS WITH GOGO GEAR PROTECTIVE LEGGINGS MADE OF 100% DUPONT™ KEVLAR® FIBERS - WHY ACCEPT ANYTHING LESS? Never before has a product been so hotly anticipated! GoGoGear Protective Leggings can be used as a base layer under other garments for extra protection against abrasion. Like all GoGo Gear products, they are designed to look like regular fashion leggings but offer the protection of Dupont™ Kevlar® abrasion resistant fibers and CE-approved removable and adjustable knee protectors. CAUTION: THE US SIZES 4 - 12 RUN SMALL! 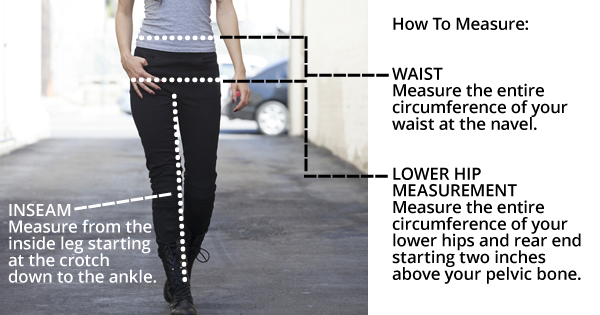 DO NOTSELECT A SIZE BASED ON YOUR CURRENT PANT SIZE! All SIZES FROM 14 UP RUN "TRUE TO SIZE" MEANING YOU CAN ORDER THEM BASED ON YOUR REGULAR US PANT SIZE! 3. If you consider yourself to have a "flat" rear end, go with the size listed. If you have a "curvy" or "extra" in the rear, go one size up. If you have ANY questions about sizing or aren't sure, please email desiree@scooter-girls.com so we can be sure we send you the size that makes the most sense for you! We pay shipping on the initial purchase. All exchanges and returns are the responsibility of the customer. PLEASE SELECT YOUR SIZE CAREFULLY. If in doubt, just email us at: cyclehouseslc@gmail.com It is our pleasure to assist you in selecting the best fit. SIZE CHART (IN INCHES) - CAUTION: DO NOT RELY ON YOUR REGULAR PANTS SIZE. THIS CHART IS A GUIDELINE, SUGGESTING A COMFORT FIT, DEPENDING UPON BODY CONTOURS. To purchase hip protector pads separately, you can select from any of the following as each will fit the pockets in the GoGo Gear Kevlar Leggings. Wash in COLD water with mild detergent. Hang to dry OR dry on the AIR setting. You do NOT need to remove the protectors when washing the garment. Use Woolite Darks for washing if possible to retain the dark black color. As with all dark fabrics, fading may occur. If fading occurs, use Rit-Dye Fabric Dye to help restore the garment to its original color. We can ship to virtually any address in the world. GoGo Gear may offer a shipping promotion at their discretion. Outside of the promotion period, customers pay the initial shipping cost on orders, and any shipping costs associated with returns or exchanges, unless the item is defective, damaged or incorrect before you receive it. great womens pant alternative :) I'm in love!!! Saw a girl wearing these after months of searching for pant that didn't either fit like a box or cost $400. I found my saviour :) Hard time finding my size online, but I got great service from the owner of the company (GoGo Gear). Only real issue is size, I'm 5' 2" and wear a 8-10 pant normally. I ordered the size 12 thinking that they run small, I probably could have gotten a 10. UBER comfy, decent price, WIN!!!!! GoGo Gear leggings - just what I was looking for! So much less bulky than riding jeans, and stretchy and comfortable. I've worn mine twice now and am very pleased with them. I haven't used the knee pads on the road yet (I just have to get used to that feeling) but I like the thickness of the fabric. Hoping they hold up for quite a long time! I'm very curvy on a 5'4" frame, so I ordered them 1 and 2 sizes up to try them. I kept the larger of the two for ease of pulling up and down but I know I'm going to wish i kept the smaller size when I lose 10 pounds or so. We shall see.